As dissent to Sudan’s ruling National Congress Party, or NCP, grows, the elusive question of what an alternative government would look like has spurred visionary documents from Sudan’s opposition groups. On October 4, members of the armed opposition the Sudan Revolutionary Front, or SRF, met in Kampala and signed a 20-page document entitled “The Restructuring of the Sudanese State,” which offers an alternative blueprint to President Bashir’s authoritarian regime. This unprecedented agreement marks the first time the SRF has outlined a plan for how Sudan can transition from a dictatorship to democracy. According to the Sudan Tribune, the document calls for an interim period of six years to reorganize the state of Sudan and provide more power to the provinces. During the interim period, the government would be led by a collegial body chaired by a president, and state governors would serve as vice-presidents. Radio Dabanga reports that the rebels stressed that a new constitution would ensure diversity of ethnicity, culture, and religion in Sudan. At the meeting, the SRF also discussed the deteriorating humanitarian crisis in South Kordofan and Blue Nile, and recent atrocities committed in Darfur. The SRF document follows the release on September 24 of the full text of the Democratic Alternative Charter, a parallel document, by the National Consensus Forces, or NCF. 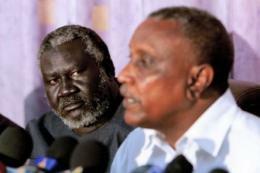 The NCF, a coalition comprised of Sudan’s main political opposition parties, including the National Umma Party, the Islamist Popular Congress Party, and the Sudanese Congress Party, originally signed the charter on July 4. It calls for using “political, popular, and peaceful means” to topple the Bashir regime and establishing a transitional system to be governed by a “Constitutional Declaration” that is in the drafting stage. Although there are fundamental differences between these two documents, both lean toward inclusivity of the periphery—a critical component that is missing in the ruling NCP’s longtime approach to governance. Ousting the current regime is going to be the real challenge as Bashir is doing all that he can to tighten his grip on power. Following the recent agreement between Sudan and South Sudan, the NCP invited all political opposition groups to a constitutional conference to prepare a permanent constitution that would supersede the current transitional one. All the opposition groups rejected the invitation, stressing the need for an inclusive process that would allow rebel groups to participate and address the conflicts in Darfur, South Kordofan, and Blue Nile. This smoke screen of an inclusive constitution drafting process is the NCP’s latest attempt to consolidate its power amid the growing threat of an alternative regime. Moving forward, the SRF and NCF’s alternate “blueprints” of how to govern Sudan can serve as powerful tools to help shape the future of the country and build a foundation of support among Sudanese citizens and the international community for the path forward to a democratic transition.